For many, 2012 and 2013 may be two years to forget as austerity in developed nations, recession in Europe, slowdown in China, and uncertainty all combined to hinder growth. The European economies seem to be emerging from a secondary recession but recovery is tentative at best. The BRIC [Brazil, Russia, India and China] economies have been weighed down (much like a brick) but it does appear that China now is improving. Inflationary pressures have eased and monetary policy around the world is striving to foster growth. The manufacturing sector represents the primary customer base for chemicals. Global manufacturing entered a soft period in 2012, with particular weakness in Europe and East Asia. However, manufacturing is beginning to turn upward, led by the United States, the United Kingdom and other nations. Figure 1. Growth should remain modest this year but should pickup in 2015. In the United States, the economy is stuck in a slow-growth mode as higher taxes, debt and regulatory burdens combined with political uncertainty take a toll on both business and consumer confidence. As a result, businesses were cautious and cut back on capital spending. Furthermore, weakness in overseas markets and a higher value of the dollar against other currencies dampened U.S. exports. However, light vehicle sales, housing activity and asset prices are moving higher and employment slowly is improving, and so consumers are spending. Moreover, the United States is in the midst of an unconventional oil and gas boom that supports economic growth and industrial activity. The Chemicals Activity Barometer (CAB) is encouraging. The CAB, which was developed by the American Chemistry Council (ACC) and appears monthly in CP's Economic Snapshot, is a composite index of economic indicators that tracks the activity of the chemical industry. 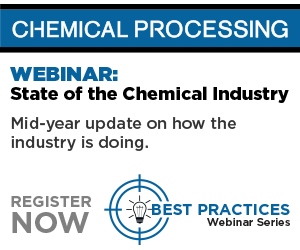 Due to its early position in the supply chain, chemical industry activity leads that of the overall economy. So, the CAB provides a way to anticipate potential turning points in the overall economy. The CAB currently is signaling slow, tentative economic growth in 2014. The consensus forecast (our base-case scenario) for U.S. gross domestic product (GDP) is for continued but modest growth in 2014, about 2.6%, which is well below the historic trend, increasing to 3.1% in 2015 and beyond (Figure 1). Many macroeconomic factors are projected to improve over the next two years (Table 1). However, long-term growth in the U.S. economy will slip due to demographic, policy and other factors. Table 1. Each of the indicators should improve during 2014 and 2015. Chemicals production is benefiting from strength in the light vehicles and aircraft sectors, and a recovery in construction materials and some industries involved with business investment. However, a number of sectors (appliances, textiles, paper, printing, etc.) still remain weak. Forward momentum depends upon demand for consumer goods, which ultimately drives factory output. Light vehicles represent an important market for chemicals (nearly $3,550 per vehicle), and production continues to improve. U.S. sales are expected to rise in 2014 and 2015 as pent-up demand, improving employment (and income) prospects, and better availability of credit foster growth. Housing is the other large consumer of chemicals (over $15,000 per start) and here housing prices have begun to appreciate, credit conditions appear to be repairing, and favorable demographic factors are reemerging as a driving force. So a gain in housing starts should occur in 2014 and 2015. Activity should remain well below the previous peak of 2.07 million units in 2005 but, by the second half of the decade, activity should approach the long-term underlying demand of 1.5 million units per year as suggested by demographics and replacement needs. Basic chemicals — inorganic chemicals, petrochemicals, plastic resins, synthetic rubber and man-made fibers — were hardest hit by the recession in Europe and manufacturing slowdown, despite improving demand from important customer markets such as light vehicles and housing. Downstream customers remain cautious about building inventories, but improvements in final demand could necessitate replenishing. Leading indicators of manufacturing activity aren't yet pointing to strong growth. The consensus is that U.S. chemicals output should improve during 2014 and into 2015 (Table 2). The volume of chemicals, excluding pharmaceuticals, which grew 2.1% in 2012 and 2.5% in 2013, should rise by 2.8% in 2014 and a 3.3% in 2015. Plastic resins should see strong growth as export markets revive. Meanwhile, robust demand from end-use markets, most notably light vehicles and housing, should drive increased production of specialty chemicals. Strong 2013 gains are expected in consumer products as well but these gains will moderate in 2014 and 2015. Demand for agricultural chemicals (and their supply from the United States) should revive. In the long-term, chemicals output growth should expand at a pace exceeding that of the overall U.S. economy. Pharmaceuticals should emerge as a growth segment in 2015. Table 2. Growth in 2015 should exceed that of 2013 for all sectors but consumer chemicals. Although projected year-on-year growth rates for most segments during the next few years appear good, they must be considered in the context of the exceptionally sharp declines seen in 2008 and continuing into 2009. It may take years for activity to surpass past peaks. The expected modest gains in chemical industry production volumes and stable capacity suggest improving operating rates in 2013 and, with strengthening production volumes, capacity utilization could improve even further in 2014 and beyond. The possibility of perhaps 150 projects spurred by shale gas (see below) should result in fairly strong gains in capacity through 2018. Abundant long-term supplies of natural gas from shale as well as oil from shale and other unconventional sources are possibly the most important domestic energy developments of the past 50 years and, for the chemical industry, the most important since the 1930s. Following a decade of high and volatile natural gas prices that destroyed industrial demand and led to the closure of many gas-intensive plants, shale gas offers a new era of American competitiveness. Growth in domestic shale gas production is helping to reduce U.S. natural gas prices and create a more stable supply of natural gas for fuel and power. It also is leading to more affordable supplies of natural gas liquids (NGLs), including ethane, which is a key petrochemical feedstock. Figure 2. Enhanced U.S. competitiveness already has led to announcement of projects worth about $90 billion. Thanks to shale gas, the competitive position of the United States has improved, prompting plans for significant new investments (Figure 2). We count about 135 chemical-industry projects valued at over $90 billion announced in the past three years to capitalize on the abundant supplies of natural gas and NGLs. This is a supply-side response and, if incorporated into projections, suggests a much higher growth profile moving past 2015. Indeed, growth likely will average over 4% per year in the second half of the decade. Such projects include new ethylene crackers, as well as plants for derivative products (e.g., polyethylene and ethylene oxide), methanol, ammonia, on-purpose ethylene coproducts, etc. When all is said and done, the number of major projects should exceed 150 (possibly reaching 200) and should represent perhaps $112 billion in investments by 2025. Shale gas should spur the creation of more than 46,000 direct jobs in the U.S. chemical industry. The abundance of shale gas (and the resulting disconnect between U.S. natural gas prices and global oil prices) should boost U.S. exports in the years ahead. Large trade surpluses in basic chemicals should increase, as should surpluses in specialties and consumer chemicals. These should continue to more than offset the trade deficit in pharmaceuticals, resulting in growing trade surpluses. In all, chemical industry growth in the United States should surpass that in Western Europe. Figure 3 compares the likely growth of the U.S. chemical industry and baseline projections for the chemical industry in Western Europe. As production from new investments comes online over the next several years, the United States should capture market share from Europe. Shale gas also is spurring substantial investments in other manufacturing sectors — including in areas of the country that had been hard hit by industrial decline. The United States has emerged as the place to invest! Figure 3. The United States likely will capture market share from Western Europe in the coming years. The industry's expansion also is reversing the declines in employment that occurred each year from 1999–2011. The number of jobs in the chemical industry is expected to have increased by 1.3% (to 794,000) in 2013 — and growth should continue through 2018. At that time, industry employment should approach 810,000. The impact on local economies will be significant since chemical industry workers are among the highest paid in the manufacturing sector. Because U.S. manufacturing is set to gain substantially, due in large part to shale gas development, government and industry must work together to ensure that the American workforce is prepared for the jobs building and working in the emerging manufacturing renaissance. Between a graying manufacturing workforce and decades of young people turning away from careers in manufacturing and the trades, there is concern about the quality and quantity of workers available for the diverse portfolio of skilled manufacturing and construction occupations that will be required in the coming years. Addressing this concern will require concerted efforts. In summary, the global recovery stalled in 2012 and 2013 — with Europe slipping back into recession and manufacturing in China slowing sharply. In the United States, uncertainty, higher taxes and debt, and other factors curbed growth. More than four years since the official end of the recession, the majority of manufacturing industries remain below their pre-recession peak. In the coming year, growth should accelerate across most regions of the world. The U.S. should particularly benefit because of the favorable oil-to-gas ratio in North America — and emerge as a global low cost supplier of many petrochemical and plastic products. As balance sheets continue to improve and the nation's shale resources are developed further, chemical producers and other manufacturers are bringing investment back to the United States. This manufacturing renaissance offers huge potential, not only to the millions of American workers it will employ, but the U.S. economy as a whole. THOMAS KEVIN SWIFT is chief economist and managing director of the American Chemistry Council, Washington, D.C. E-mail him at Kevin_Swift@americanchemistry.com. Proper front-end-planning and project evaluation are crucial for achieving success.